Candoia paulsoni’s background colors run the gambit from red, gold, orange, tan, and bluish-brown. There have even been some leucistic C. paulsoni found. Patterning consists of a dark dorsal zig-zag pattern from head to tail. Candoia paulsoni have the ability to darken and lighten their base color throughout the day. 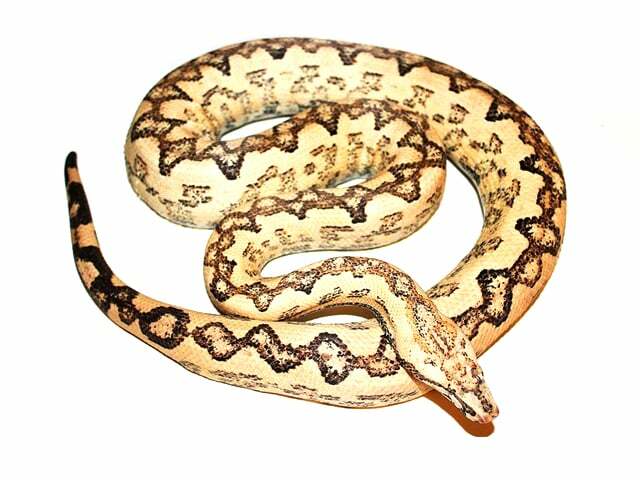 Isabel Island (the prettiest Candoia) boas, a possible subspecies, are locality variations that usually have white base coloring with a dark dorsal striping. Adults require a minimum dimensions of a 0.8 x 0.5 x 0.5 meters (2.6 x 1.6 x 1.6 feet) – but bigger is better. Hatchlings and subadults can be kept in smaller enclosures. Being semi-arboreal boas, the enclosure should be fitted with several perches of different thickness to allow them to properly function. All snakes are escape artists! It is very important to provide a secure cage, and to remember to tightly close it. Candoia paulsoni of all sizes will use a hide box if given the option. Being semi-arboreal they will usually be out on display rather than in a hide, but newly acclimating animals as well as animals in shed or digesting will use a hide box if given one. There are a lot of options for the substrate. Aspen, chips, coco husk, peat moss or sphagnum moss. It’s recommended to have a thick layer of substrate in order to help with the humidity of the enclosure. Snakes need a photo period light cycle; provide 8–12 hours of light daily; do not leave white light on at all times; to view snakes at night use a black or infrared light. In their natural environment, the climate is relatively constant throughout the year, both in terms. Temperature and humidity. A local hot spot should be around 30 °C (86 ºF) and the ambient temperature in the range of 23-25 ºC (73-77 ºF). A large water bowl should also be available at all times. A weekly water bowl change is necessary regardless of whether it appears clean or not. The humidity should be in the range of 60-80%. Remember to spray the enclosure often. These snakes tend to drink water drops from the foliage. It is important to have good ventilation and to be able to dry out the vivarium sometimes. In the wild this species primarily eats small lizards and amphibians, but can be switched to take rodents and works fine on such a diet. They are known to be difficult to get to eat in captivity and in addition known to keep eating breaks which is completely normal as long as they do not loose weight. These snakes have a slow metabolism, so an appropriate sized prey should offered every 2 or 3 weeks. Be aware that greedy animals may tend to get overweight. Females during the breeding period can be fed weekly up to the pairing in order to build mass. However, it is particularly during this period that the long meal breaks occur. Juveniles can be fed weekly in the first year an appropriate sized meal. Some individuals and calm and some quite defensive. Be safe and use a hook to pick them and feel how the temper is that day. Beware that they can strike very fast and sideways! When an animal is in shed we lightly mist the animal down a couple times a week with a spray bottle until they have completed the process. Make sure to provide fresh water in their water bowl daily as many snakes will choose to soak continuously during this period. Fun fact: Candoias rough scales pick up soil for camouflage. Freshly shed snakes will look quite colorful, but will soon fade to a dull appearance because of this. Mouth rot and scale rot are potential health problems. Be sure to provide excellent ventilation.